Promo gift are such a valuable incentive to any business marketing campaign as they have a tremendous high perceived valuable and its totally inexpensive for the company. Brand identity is usually established through entrenching your company image, logo, motto and core beliefs into the consciousness of your customers, clients and, indeed, potential customers and this is something that is often achieved through the use of promo gift. For instance, this cigarette case could be a really good example of a cheap item you could deliver to your customers within the cigarette industry. 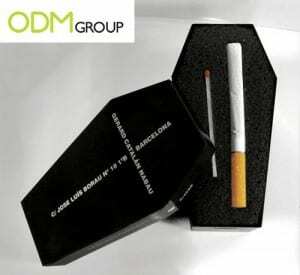 So, how does this promo gift help the cigarettes brands? Cigarette cases are such a simple way of attracting and retaining customers as it is very practical and useful for people when it comes to carrying their cigarettes around instead of the whole packet. Also, the design of this case is targeted more for the upper class where customers will feel very important. Within this case you can also place a match to be able to light your cigarettes whenever you want. Business gifts take advantage of perhaps the most powerful word in the English language: free. Offer someone something for free, and you’ve immediately got their attention. This makes it an excellent way of building relationships and boosting business. Promo gift such as this one help your brands boost their brand awareness, save money, improve image & perception, rise sales, maintain loyalty and develop employee relations.Promotional gifts are a cost-effective and dependable way to give your company advantages in the business world. No matter what industry you’re in, it’s a good idea to incorporate a business gift into your marketing strategy. Una vez más estamos recopilando ideas para ofrecer a nuestros clientes. En este caso nos referimos a regalos promocionales que atraerán a nuestros clientes a volver a comprar de nuevo. Por ejemplo, tenemos este estuche para guardar nuestros cigarros y llevarlo a cualquier lugar. Una idea muy práctica e idónea para ganarse la confianza de nuestra clientela.